At Junaluska students grow as readers by participating in a balanced reading program. A balanced reading program consists of interactive read-aloud, shared reading, guided reading, independent reading, interactive writing, writer’s workshop, spelling, and phonics. Our students are encouraged to value independent reading both at school and at home. Each day they are given time to read independently and nightly homework includes a required amount of independent reading. We celebrate students’ independent reading achievements! Each day students read with teachers at their instructional reading level. Lessons are designed by the teacher to assist students in develo ping a deeper understanding of text. This is called a Guided Reading lesson. Students will meet with the teacher and read in a small group setting. Many classrooms offer a Readers Workshop time based on Lucy Calkins, Units of Study for Teaching Reading. This reading instruction offers a mini lesson to address the development of reading skills, a whole group practice, small skill group reading, partner reading, independent reading, and conferring with the teacher. We use The Comprehension Toolkit by Stephanie Harvey and Anne Goudvis as a framework for teaching comprehension strategies to students in all grade levels. 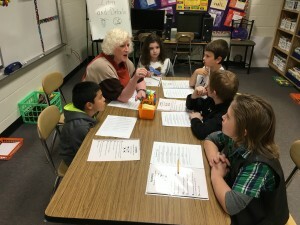 Students learn strategies for monitoring comprehension, making connections, questioning, inferring, determining importance, summarizing, and synthesizing information from text. Teachers offer interactive read-aloud each day where they read aloud picture books and use the text to model the use of comprehension strategies. Students need lots of modeling prior to being asked to try a skill independently. 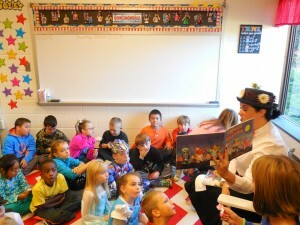 Interactive read-aloud offers the student this valuable learning experience. Shared Reading in the classroom allows the opportunity for the teacher to scaffold the learning beginning to give the students opportunities to practice using reading strategies with support and guidance. The teachers and students read together and discuss the use of strategies to understand text. Writers Workshop can include a mini lesson, interactive writing, and time for students to develop independent written work. Students work on many types of writing but narrative, expository, and argumentative writing are taught at each grade level. We want students to see themselves as authors and understand that they have something to share with the world.